If you don't want to be stuck indoors on your wedding day, you need to think about a cheap outdoor wedding idea! The sun will be shining, the day is perfect, you look gorgeous and everyone is having a good time. What would be the best way for you to have your wedding reception outdoors? Your biggest expense will end up being the hire of the venue, so see if you can save money by having your wedding in your backyard or your parents. If you don't fancy that then have a look at other free venues such as the beach, or local park. 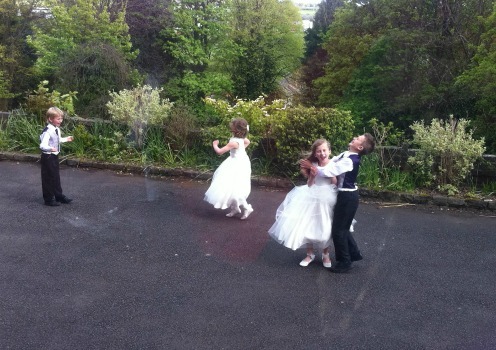 Plus if you are having children at the wedding then they can have fun running around instead of getting a bit bored sitting and stressing out their parents. Outdoor venues are not always free so check with the local authorities as to whether you can hire the space for your wedding. There may end up being a small cost, which would be better thhan a large one, but you don't want anyone turning up on the day saying you can't be there! Keeping your wedding local is a great way to save money as transport costs will be less and you will be able to get friends and family to help. Think about where you live, is it by the sea? Then a cheap beach wedding could be for you! If you live in the countryside then think about whether you could have a marquee in the garden or in a friends garden. Tips on how to save money on your marquee will ensure you don't spend over the odds. If you are having an informal wedding, a wedding picnic would be fun. You could lay out blankets and have hampers on each with the food and drink goodies. To make it more formal think about the age when servants would carry all the best china and furniture for an outdoor picnic. You could have a buffet for the wedding banquet. A barbeque is definately informal! I would recommend that you have someone doing the cooking as you could be there all day to ensure all of your guests have what they want. And if you are thinking about holding your wedding at your own home here are lots of backyard wedding reception ideas to get you started! I have heard of wedding receptions on steam boats and unused railway stations. All you need to think about is what is near you for your own outdoor wedding idea! I am well aware it sounds kind of silly to have to decorate outside and to be honest you don't have to. But if your outdoor space is not quite as glamorous as you would like then you may want to add a few touches to make the space your own.